Posted April 1, 2019 by Author & filed under blog, Music, Station Updates. Check your email boxes, Justin just sent out the newsletter! Make sure it isn’t in your promotions folder. We’re closing in on our 40th Birthday in September! Stay tuned for updates, and how to get in on the party of a lifetime. It’s only with your support that we’re going to stay on the air for another 40 years and beyond. Are you a Circle of Friends member yet? It’s the best way to give. If you’re already in the circle, talk to a friend or family member about supporting community radio that gives them a voice. They can donate here, or you can increase your monthly gift. Thank you! Another great way to support your station is our vehicle donation program. Got an old car sitting around collecting dust? 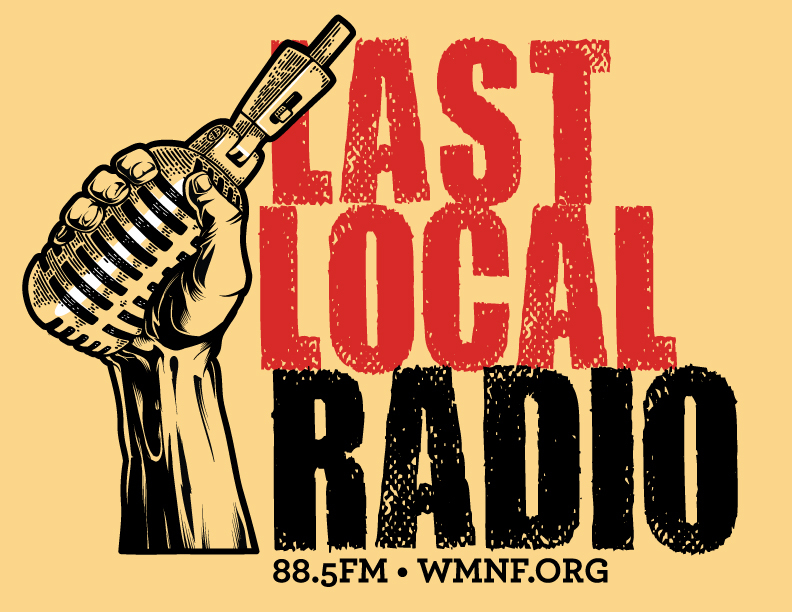 Donate it to WMNF and turn your burden into a gift. Call 1-888-966-3885 and we’ll take that old car or truck off your hands! When Scott Elliott moved from New York City to Tampa in 1996, he found himself in a place where he missed the lively and overflowing culture of the city he grew up in. He yearned for a resource to discover the heart and soul of Tampa. Scott and his partner were on the way back from a trip to Atlanta when they first encountered WMNF. At Skipper’s Smokehouse events they would look for their favorite DJs. They started volunteering at Tropical Heatwave. They first year they did cleanup afterwards, the second year they ran water to all of the stages and performers. When WMNF moved into its current studios in 2005, Flee was looking for people who would like to move CDs from the old building to the new one. During the move, Scott met more DJs at the station and began learning the ropes in the studio. Soon after, he started filling in on certain shows when the hosts couldn’t make it. Scott took the programmer class and submitted a proposal to Randy. Because he was doing so well subbing, Randy offered him an early morning spot from 4 – 6 am. This was the beginning of “All Souls”. Scott worked the early morning shift for two years and hosted a variety of other shows as was needed. His hard work and dedication paid off when he was offered a prime time spot for It’s The Music! All Souls on Wednesday. The community’s love and respect for Scott shone recently as he endured a bout with cancer. It’s this kind of outpouring of support and kindness that separate community radio from the rest. Two Worlds Indigenous Radio brings to life the voices of Native people, their traditions and culture. 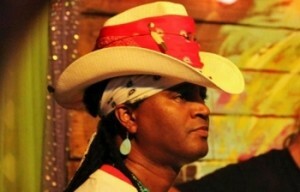 Alvon Griffin hosts the show, and unfurls a world of classic, traditional, contemporary and experimental Native music. He’s influenced by his own Native roots, along with the communities he grew up in, from Boise to Berkeley to Tampa. Alvon first heard of WMNF during its infancy, when the station was still operating out of a house in South Tampa. At that time, Alvon had no thoughts of being on the radio. It was years later when he decided to submit a proposal for a show called Brazilian Tropical. 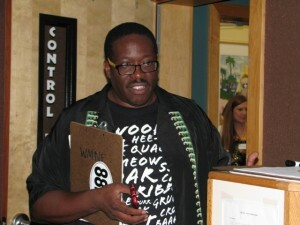 Alvon spent time hosting multiple shows at once and subbing for other shows, putting in the work where it was needed. Eventually he was asked to fill in on Two Worlds, when the hosts needed time off. He changed the name because he really wanted to focus in on Native artists and indigenous people’s current affairs. Alvon’s family is Native and African. This, along with growing up in Boise, Idaho where the largest minority is Native, has influenced Alvon in his musical journey. Beyond bringing Native consciousness to WMNF’s listeners every Sunday, Alvon has used his musical talent to teach young people the therapeutic aspects of music. Such dedication to the well being of the community comes as naturally to Alvon as his dedication to the music and art of his people. WMNF gives him a place and a platform to share his important insights.